Background: Different pattern materials do not produce copings with satisfactory, marginal accuracy when used on stone dies at varying time intervals. Purpose: The purpose of this study was to evaluate and compare the vertical marginal accuracy of patterns formed from three materials, namely, thermoplastic resin, light cured wax and inlay casting wax at three-time intervals of 1, 12, and 24 h. Methodology: A master die (zirconia abutment mimicking a prepared permanent maxillary central incisor) and metal sleeve (direct metal laser sintering crown #11) were fabricated. A total of 30 stone dies were obtained from the master die. Ten patterns were made each from the three materials and stored off the die at room temperature. The vertical marginal gaps were measured using digital microscope at 1, 12, and 24 h after reseating with gentle finger pressure. Results: The results revealed a significant statistical difference in the marginal adaptation of three materials at all the three-time intervals. Light cured wax was found to be most accurate at all time intervals, followed by thermoplastic resin and inlay casting wax. Furthermore, there was a significant difference between all pairs of materials. 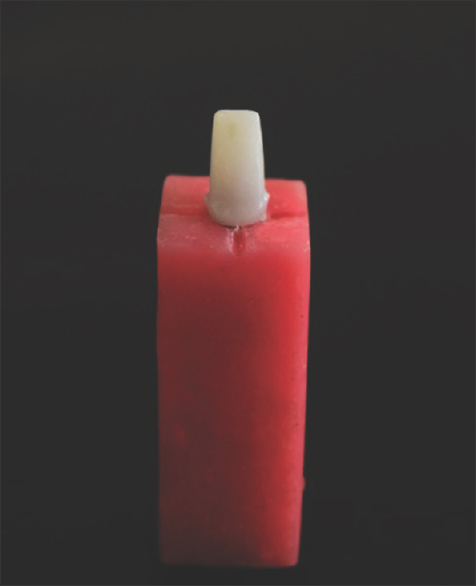 The change in vertical marginal gap from 1 to 24 h between thermoplastic resin and light cured wax was not statistically significant. Conclusion: The marginal adaptation of all the three materials used, was well within the acceptable range of 25–70 μm. The resin pattern materials studied revealed significantly less dimensional change than inlay casting wax on storage at 1, 12, and 24 h time intervals. They may be employed in situations where high precision and delayed investing is expected. Introduction: The two implant-supported overdentures have overcome the retention and stability-related problems of conventional mandibular denture. Stud attachments are widely available, less expensive, and easy to use. Aims and Objectives: To determine fatigue resistance of two different stud attachments with two denture base materials – autopolymerizing and heat cure acrylic resin till 4320 cycles simulating 03 years of service. Materials and Methods: Stud implant overdenture attachments, i.e., ball and socket and Dalla Bona attachments were tightened over the implants in two different mandibular edentulous base models. 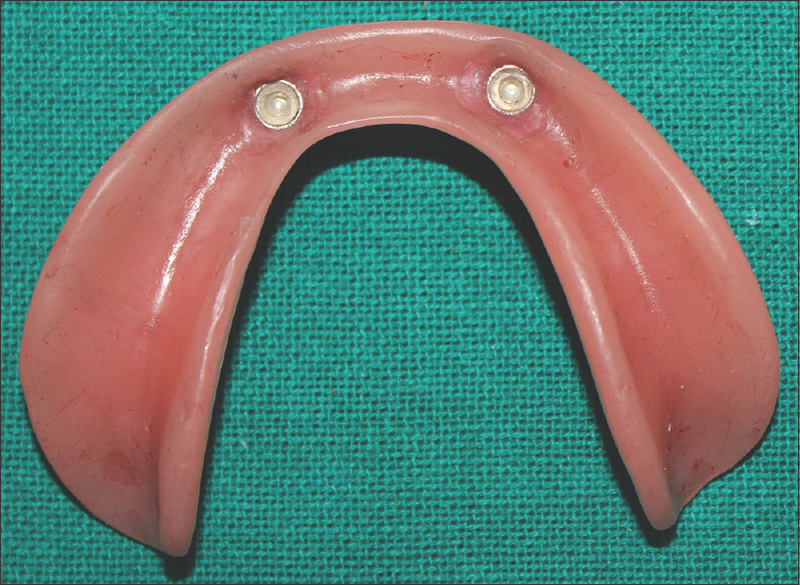 The housings were incorporated with both direct (chairside) and indirect (laboratory) technique into conventional mandibular dentures. These overdentures were subjected to continuous removal and insertion on Universal Testing Machine till 4320 cycles simulating 3 years of service assuming that patient takes out denture, 4 times in a day. The fatigue resistance was calculated for 0, 1440 (1 year), 2800 (2 years), and 4320 (3 years) cycles. Unpaired and paired t-tests were applied to find the level of significance. Results: Ball and socket attachments housed with heat cure acrylic resin (indirect technique) had the highest values of fatigue resistance at all cycles. Following were Dalla Bona attachments with autopolymerizing acrylic resin (direct technique), ball and socket attachments with autopolymerizing acrylic resin (direct technique), and Dalla Bona attachments with heat cure acrylic resin (indirect technique) as per statistical analysis. Conclusion: Two implant-supported mandibular overdenture with ball and socket attachments incorporated by indirect technique showed higher values in terms of retention and absence of disengagement/fracture of components. Purpose: The purpose of this study was to compare and correlate sagittal condylar guidance determined by intraoral gothic arch tracing method and panoramic radiograph in edentulous patients. Materials and Methods: Twelve completely edentulous patients were selected by the inclusion and exclusion criteria. Conventional steps in the fabrication of complete denture till jaw relation were carried out. Intraoral gothic arch tracing and protrusive interocclusal records were obtained for each patient. Protrusive interocclusal record was used to program the Hanau Wide-Vue semi-adjustable articulator, thus obtaining the sagittal condylar guidance angle. Using RadiAnt DICOM software, on the orthopantomogram obtained for each patient in the study, two reference lines were drawn. The Frankfort's horizontal plane and the mean curvature line (joining the most superior and the inferior points on the glenoid fossa curvature) were drawn. The mean curvature line was extended to intersect the Frankfort's horizontal plane, thus obtaining the radiographic sagittal condylar guidance angle. The condylar guidance angles obtained by these two methods were compared and subjected to paired t-test. Results: There was no statistically significant difference between the sagittal condylar guidance angles obtained between right and left sides with intraoral gothic arch tracing and radiographic methods (P = 0.107 and 0.07, respectively). Conclusion: Within the limitations of this study, it was concluded that the protrusive condylar guidance angles obtained by panoramic radiograph may be used for programming semi-adjustable articulators. Aims and Objective: Oral biofilms in denture wearers are populated with a large number of bacteria, a few of which have been associated with medical conditions such as sepsis and infective endocarditis (IE). The present study was designed to investigate the relative presence of pathogenic bacteria in biofilms of denture wearers specifically those that are associated with IE. Methods: Biofilm samples from 88 denture wearers were collected and processed to extract total genomic DNA. Eight of these samples were subjected to 16S rRNA gene sequencing analysis to first identify the general bacterial occurrence pattern. This was followed by species-specific quantitative polymerase chain reaction (qPCR) on entire batch of 88 samples to quantify the relative copy numbers of IE-associated pathogens. Results: 16S rRNA gene analysis of eight biofilm samples identified bacteria from Firmicutes, Actinobacteria, Proteobacteria, Bacteroidetes, and Fusobacteria species. Interestingly, Streptococcus mutans, Veillonella atypica, and Granulicatella adiacens from Firmicutes, all known to be associated with early-onset sepsis and IE was present in five of eight biofilm samples. The other three samples carried bacteria from genus Proteobacteria with Neisseria flava and Neisseria mucosa, which are known to be commensals, as dominant species. Species-specific qPCR of S. mutans V. atypica, and G. adiacens on 88 biofilm DNA samples identified the presence of S. mutans in 83%, V. atypica in 79%, and G. adiacens in 76% of samples. Conclusion: The findings from the present study demonstrate co-occurrence of S. mutans, V. atypica, and G. adiacens in a majority of denture wearers, which is clinically significant as elderly patients with compromised immune system are more prone to develop IE. To the best of our knowledge, the co-occurrence of S. mutans, V. atypica, and G. adiacens is being reported for the first time in biofilms of denture wearers. Context: Dental magnets are used for retaining removable prostheses such as a removable partial denture, complete denture, and maxillofacial prosthesis. They provide good retention for the prostheses. However, the elements released from the magnets may be cytotoxic for the tissues. Therefore, it is necessary to evaluate their cytotoxic effect on cell lines. Aim: The aim of the study is to check the cytotoxic effect of indigenously fabricated dental magnets on animal cell lines. Materials and Methods: Neodymium-iron-boron (Nd-Fe-B) magnet was tested for cytotoxicity. The magnet was encased in a teflon cylinder. Magnets were placed in the well tissue-cultured plates together with a suspension containing NIH 3T3 mouse fibroblasts (5 × 105 cells/ml). 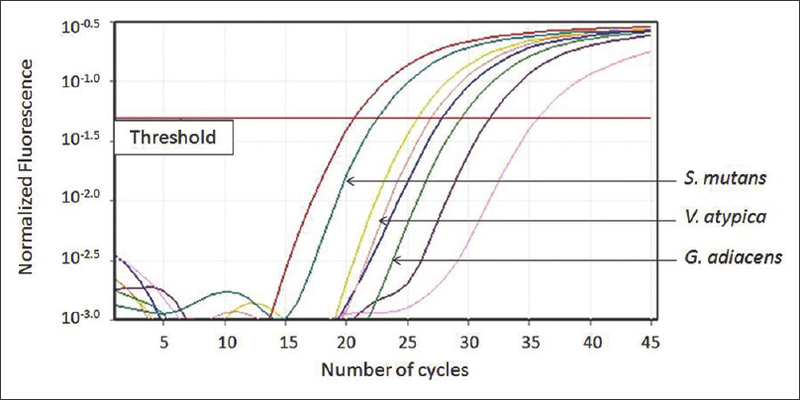 After 3 days of incubation at 37°C, cell viability was determined by mean transit time (MTT) assay. Cells were subsequently dissolved in 100 μl dimethyl sulfoxide with gentle shaking for 2 h at room temperature followed by measurement of absorbance at 570 nm. Eight replicate wells were used at each point in each of four separate measurements. Measured absorbance values were directly used for calculating percent of viable cells remaining after the respective treatment. Data were analyzed statistically with significance level set at P < 0.05. Results: The control group had highest absorbance reading for the MTT assay followed by test group. The lowest values were found with bare Nd-Fe-B magnets. One-way ANOVA test was performed for the data obtained. There was a statistical significant difference seen in the positive control (bare magnets, 44.96) and the test (teflon cased magnets, 96.90) group. Conclusion: More number of viable cells was visible in test group cells indicating that the indigenously fabricated dental magnet did not show any cytotoxicity. Purpose: The study was conducted to evaluate the accuracy of orthopantomograph (OPG) as an aid to determine condylar guidance. Methodology: The condylar guidance was measured using the impressions of glenoid fossae and radiographs (OPG) on thirty dried human skulls. Frankfurt horizontal plane (FHP) was used as a reference plane in both the methods and wire markers were adapted to make the contours of glenoid fossae discernible for both the methods. The condylar inclination angle was measured between FHP and a line joining the most concave point on the glenoid fossa with the most inferior point on the articular eminence on both right and left sides. Results: Pearson correlation was used for statistical analysis, and it showed a strong correlation between anatomic and radiographic methods (r = 0.864 for the left side, r = 0.873 for the right side) as well as between right and left sides (r = 0.830). The data were also subjected to regression analysis (linear and panel estimation approach) which showed that OPG could be effectively used to predict the condylar guidance (r2 = 0.6160). Conclusion: Although OPG shows a higher value than anatomic method, it can be used as an aid to set condylar guidance on semi-adjustable articulator. Background: Success of complete denture treatment lies in the ability to make it indiscernible from the natural. The selection of the six maxillary anterior teeth is of utmost importance as it contributes most to denture esthetics. 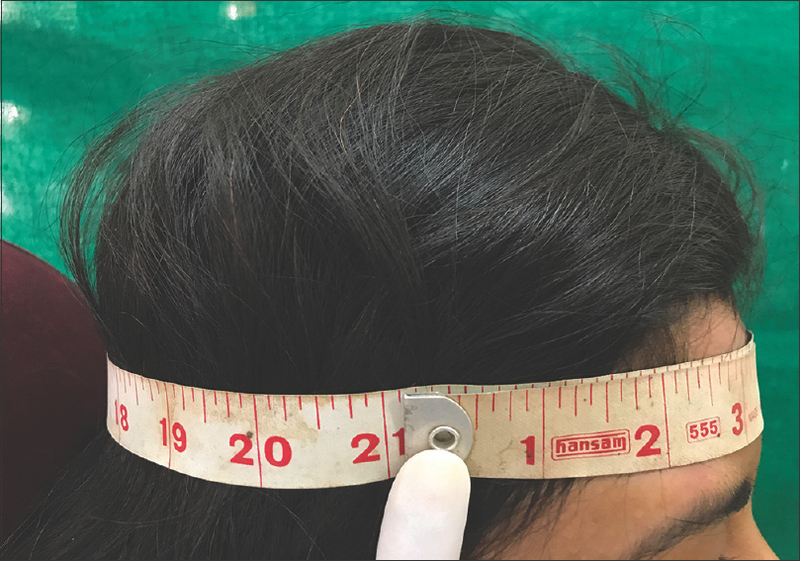 Although various techniques and methods to determine the width of maxillary anterior teeth and its relation to various body measurements were done, the simple technique of using circumference of head has been less documented, specifically for Indian population. 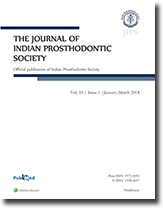 Aims and Objective: The aim of this study was to determine whether a relationship exists between the widths of the upper six anterior teeth to head circumference and the objective was to decide whether head circumference can be used as a deciding criterion to select size of maxillary anterior teeth for Central Indian population. Materials and Methods: This study was done on 300 people who included 135 males and 165 females. The circumference of head (A) and the combined width of the six anterior maxillary teeth (B) were measured and the ratio of A: B was determined. Results: EPO Info software version 6 was used to derive the statistical analysis with unpaired Student's t-tests. In male students, the mean of the ratio between the head circumferences to the combined widths of the anterior maxillary teeth was 10.14:1. In female students, the mean of the ratio between the head circumferences to the widths of the anterior maxillary teeth was 10.09:1. 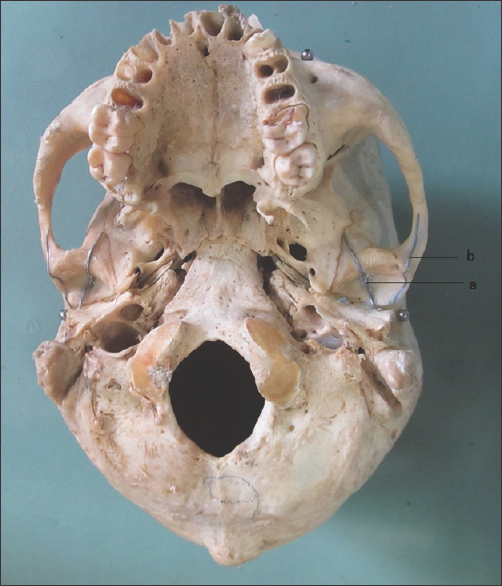 The average circumference of head to mesiodistal width of six anterior teeth ratio was concluded to be 10. Conclusion: Within the limitations of this study, the results suggest that head circumference divided by 10 can be used to select a teeth set with the resulting value as the combined mesiodistal width of six anterior teeth. This can be used as a starting point for determining the width of the anterior maxillary teeth for edentulous patients, which can be further confirmed with the esthetic appearance and with other facial measurements. Purpose: The present study aims to compare and evaluate the marginal fit and axial wall adaptability of Co-Cr copings fabricated by metal laser sintering (MLS) and lost-wax (LW) techniques using a stereomicroscope. 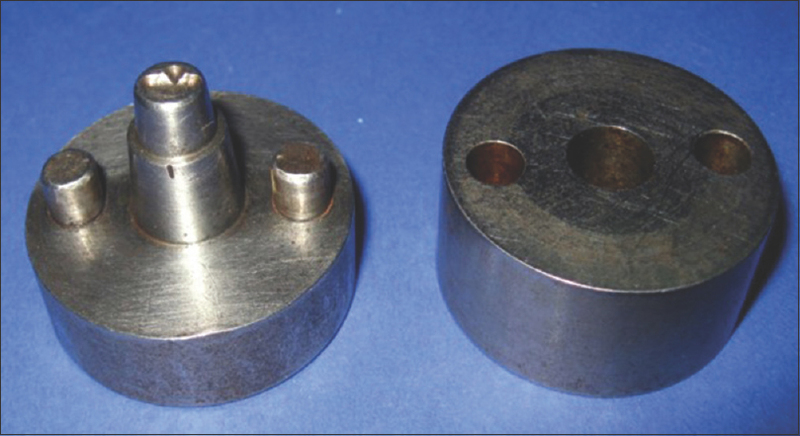 Materials and Methods: A stainless steel master die assembly was fabricated simulating a prepared crown; 40 replicas of master die were fabricated in gypsum type IV and randomly divided in two equal groups. Group A coping was fabrication by LW technique and the Group B coping fabrication by MLS technique. The copings were seated on their respective gypsum dies and marginal fit was measured using stereomicroscope and image analysis software. 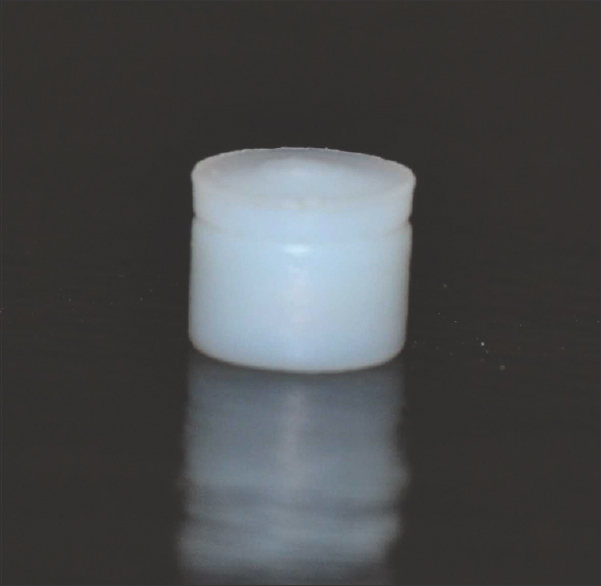 For evaluation of axial wall adaptability, the coping and die assembly were embedded in autopolymerizing acrylic resin and sectioned vertically. The discrepancies between the dies and copings were measured along the axial wall on each halves. The data were subjected to statistical analysis using unpaired t-test. Results: The mean values of marginal fit for copings in Group B (MLS) were lower (24.6 μm) than the copings in Group A (LW) (39.53 μm), and the difference was statistically significant (P < 0.05). The mean axial wall discrepancy value was lower for Group B (31.03 μm) as compared with Group A (54.49 μm) and the difference was statistically significant (P < 0.05). Conclusions: The copings fabricated by MLS technique had better marginal fit and axial wall adaptability in comparison with copings fabricated by the LW technique. However, the values of marginal fit of copings fabricated that the two techniques were within the clinically acceptable limit (<50 μm). Aims: This study aims to find the effect of change in different salivary factors before and after complete denture insertion and to measure the maxillary denture retention in different arch forms. Materials and Methods: Thirty completely edentulous individuals (10 each of square, tapered, and ovoid arch form of maxilla) belonging to the age group of 40–70 years were selected. Salivary factors (flow, density, pH, viscosity, and total protein) were evaluated before and after denture insertion. Retention of maxillary denture was measured in all the different arch forms. Statistical Analysis: Student's independent sample's t-test was applied. The correlation was analyzed by Pearson's correlation analysis. Results: While mean flow rate and pH of saliva increased, mean viscosity, total protein, and density of saliva decreased after maxillary complete denture insertion. A positive correlation was found between retention and total maxillary basal surface area. Retention value was found to be greatest in square type and least in tapered type. Conclusions: Complete denture acts as a mechanical stimulant thus increasing flow rate and pH immediately after complete denture insertion. Density, total protein, and viscosity of saliva decreased after complete denture insertion which may be due to increase in water content of saliva. The retention of maxillary complete denture does not seem to depend on the rate of change of the salivary factors, before and after complete denture insertion. Total basal surface area and maxillary denture retention values were highest in square arch form and least in tapered arch form. Objectives: The objective of this study is to evaluate and compare the depth of curve of Spee in normal dentitions and dentitions with occlusal wear using conventional and digital software techniques. Materials and Methods: A total of 70 healthy human subjects were selected for this study in an age group of 20–50 years. Group A includes the stone models (dental casts) of 35 individuals with healthy (nonattrited) dentition. Group B includes stone models of 35 individuals with occlusal wear (generalized attrited) dentition. Two methods were used for measuring the curve of Spee, i.e., conventional method and three-dimensional digital analysis method. Results: Depth of the curve of Spee between these two groups was statistically the same. The Digital software analysis (Method II) gives more accurate readings when compared with the Conventional (Method I) of measuring the depth of the curve of Spee. Conclusion: Depth of curve of Spee is maintained through the life. There is no statistical difference in depth of curve of Spee between the two groups and digital method give more accurate measurements. Facial defects can result from a variety of reasons including trauma, burns, infections, congenital disorders, and neoplasms which require surgical correction or prosthetic rehabilitation or both. Prosthetic replacement using various materials is the treatment of choice when other surgical options are not possible. 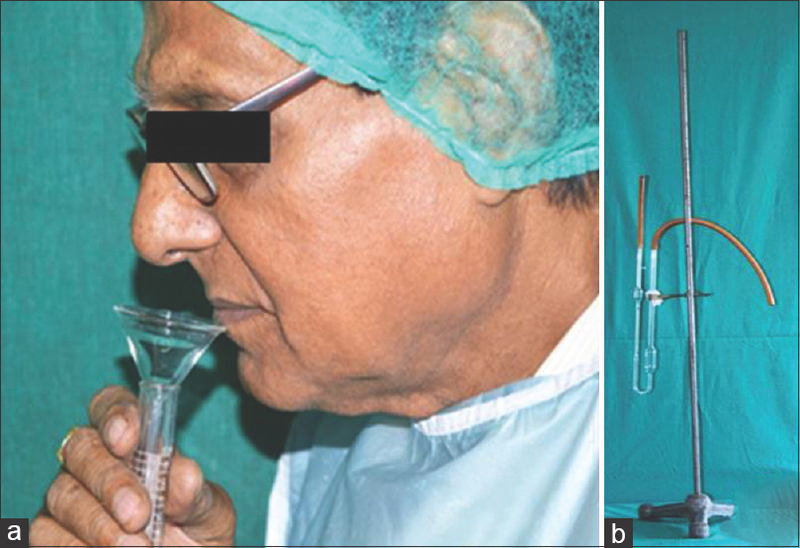 This report presents a case of acquired nasal defect secondary to a surgically operated adenoid cystic carcinoma using silicone as the material of choice. 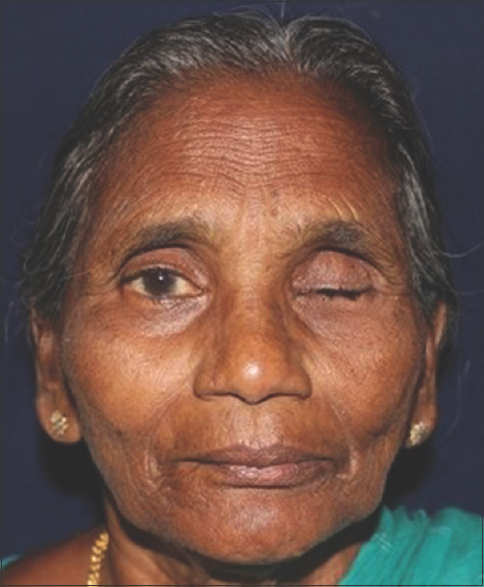 Long-term success of ocular prostheses is dictated by the retentive quality which is usually ensured by maximum possible extension into the sulcus of the eyelids. Majority of the patients experience difficulty during manual placement and removal of the prosthesis, especially when the sulcus is very deep. Ocular prosthesis is commonly removed with fingers or suction cups. Although the suction cups are popular, its efficiency lasts only for a limited period. Moreover, it is not easily available in the rural Indian market. This article presents the design of a magnetic instrument for the placement and removal of the ocular prosthesis. The defects of the skull cause mechanical vulnerability of the brain, esthetic disfigurement, and transmission of vibrations and pulsation of the brain. Subsequent cranioplasty may be required to compensate for the defect and to alleviate various signs and symptoms. 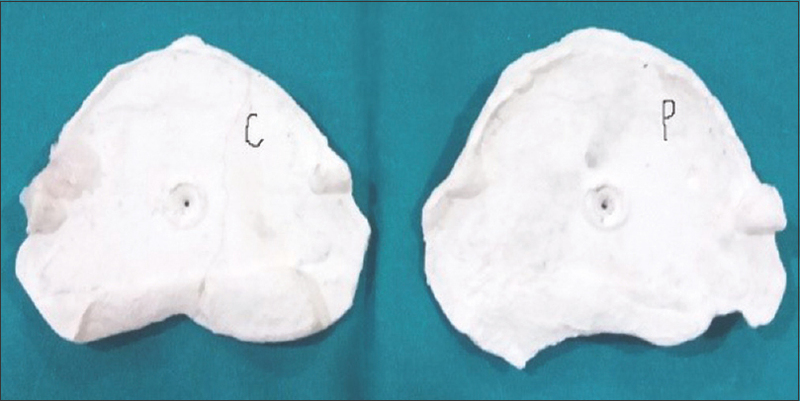 When long-term outcome of biomaterial use in pediatric cases is limited, alloplastic cranioplasty in adults are supported by several large case series. 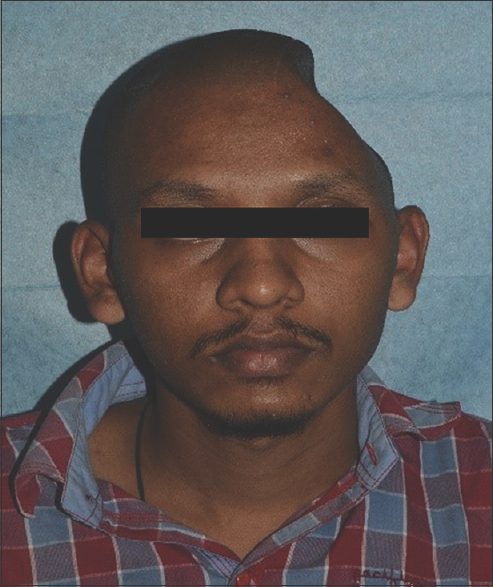 This case report narrates cranioplasty using titanium alloplastic implant material. 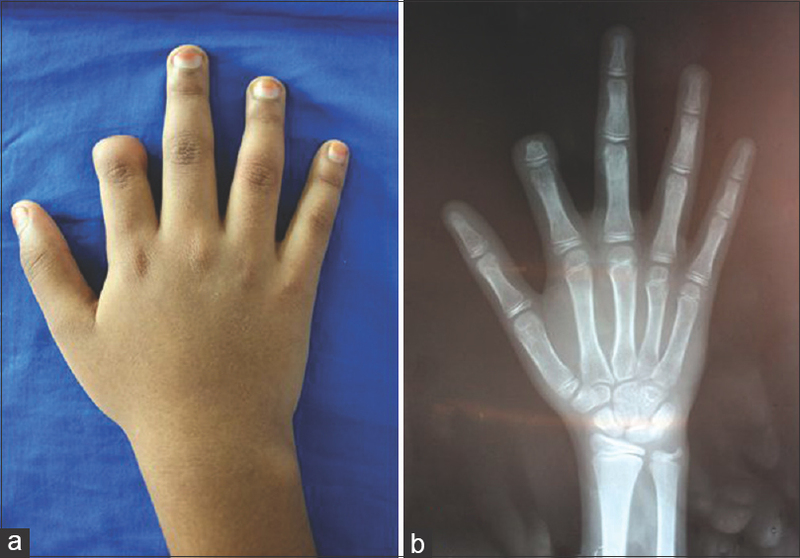 Defects of fingers or hands due to congenital reasons or trauma can be a catastrophic setback to an individual physically, emotionally, and psychologically. An artificial finger prosthesis is a lucrative option to camouflage such defects. The anatomy of the residual stump of the defect is of extreme importance and will dictate the mode of retention to be used, and the level of esthetics one can expect. Despite the availability of the advanced skills, best of materials, and laboratory support, sometimes, the anatomy of the defect may be a hindrance in furnishing a better prosthesis. 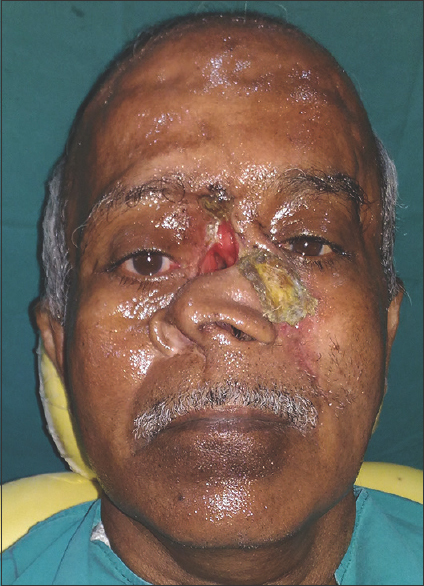 This case report describes a cost-effective and simple approach of rehabilitation of a partially amputated finger with bulbous distal anatomy using a custom-made ring-wire substructure and maxillofacial silicone, thereby striking a balance between adequate retention and optimal esthetics.